The Social Solidarity Network came into existence in the Autumn of 2009 in Dublin as an initiative of the Workers Solidarity Movement. It faded out of existence a few short months later and never amounted to all that much in the interim beyond a couple of meetings, a leaflet distribution at a mass ICTU march and a badly organised and executed protest at the Dail on budget day. Nevertheless there are some useful lessons (mostly of the ‘how not to do it variety’) to be taken from its short existence. The idea for what came to be called the Social Solidarity Network originally came from a member of the Jack White branch of the WSM in Dublin. The basic concept was to try and draw RAG and Semora Spraoi into activity around the crisis through the formation of a network that could then also pull in others from the libertarian mileu. RAG is the Revolutionary Anarcha-Feminist group, a small collective of anarchist women active in putting out an annual magazine (the RAG) and organising meeting and fundraisers in connection with this. Seomra Spraoi (Seomra) is a libertarian orientated social center in Dublin organised by a small group of people but with a very much larger number using the space in one way or the other. The WSM had debated a proposal to launch something like the SSN based on the then defunct model of the Grassroots Gathering at a national level as part of the Capitalist Crisis position paper debate but that proposal was voted down at national conference. There had been a Grassroots Gathering in Cork in the Autumn of 2008 where WSM members first tried to raise the concept of a libertarian front against the crisis but little interest had been shown in the concept at the time. This had caused us to lose interest in the Gathering as most of those involved seemed unable to break from routine issues and recognise the extraordinary period we were entering. The proposal to once more try to launch something similar to the Gathering was rejected in part because the Cork comrades felt that there was no potential for such an initiative in Cork. This didn’t preclude a Dublin only initiative but we could perhaps have done with more discussion before floating the idea outside the WSM and hence more co-ordination once this happened. At an early point the development of the idea fell to 1st of May branch, possibly because it was 1st of May members who made the first meetings to discuss the network formation. RAG & Seomra Spraoi were contacted and both indicated they were interested in the proposal. There were maybe three attempted planning meetings (not all of which were successfully held) that developed the idea of launching a network via a one day gathering in Seomra Spraoi. In hindsight a problem was that attendance at these meetings was pretty haphazard in terms of both RAG and Seomra, I'm not sure either sent a delegate to all meetings and the specific people who attended changed from meeting to meeting. This meant there was very little continuity of process from meeting to meeting outside of the WSM involvement. The decision was taken to go ahead with a one day event. The initial gathering took place in Seomra Spraoi on October 3rd 2009 (see program in Appendix). Perhaps 40 people took part but there was a very low participation from either RAG or Seomra. However quite a large number of new faces and in particular Maynooth students turned up which meant there were just about enough people present to make it look like the SSN might be something that could be built into something worthwhile. This however was really the point that WSM should have reconsidered what a workable structure for the SSN could be as it had become clear that Seomra and RAG participation in the decision making process would not be significant. From this launch one intention was to divide people into distinct sectors (students, unemployed, workers) and for each of these sectors to organise concrete outreach activity as part of building the network. Although plans were lain at the first meeting for each of the sectors I’m not sure any of these were actually implemented - except for the Maynooth student group. There were probably three or four Dublin meetings of the SSN after this date (19 October, 6 Nov after ICTU demo, 1 December ). With the exception of Maynooth the idea of organizing activity in 4 distinct sectors evaporated. The SSN did however agree the text of a leaflet and 7,000 copies of this were produced with 5-6000 being distributed at the Irish Congress of Trade Unions anti-cuts demonstration on 6th November - the demonstration itself attracted tens of thousands. Upwards of twenty people took part in the distribution on the day. A meeting after this demonstration only really attracted those already involved and a couple of people who had been around the left for years, maybe a total of 30. The two subsequent meetings which were to discuss a SSN strategy (two WSM members had prepared drafts, see appendix) were poorly attended but did decide to call a protest for the Dail on budget day (see Appendix for announcement). The WSM paid for a couple of hundred full color A2 posters 100 of which were actually put up by two WSM members. The event was attended by about 40-60 people who had probably turned up for that event but the SSN had not put any thought into what to do when that (small) number of people arrived so we just stood around for a while before heading to the pub. The Facebook event notice had 169 confirmed guests and 186 might attends which is quite a high number so there was no excuse in terms of thinking in advance that no one would come although this also made it clear that numbers would not be huge. The SSN planning, in so far as it had existed, had however assumed much large numbers - something of an angry mob. That things were allowed to (not) develop in this way was a huge failure on the part of the WSM which should have intervened to ensure that at the very least one or two speakers were organised for the night. That was the last attempted SSN event called before the WSM called a meeting to discuss the future of the SSN in late February. 11 people attended, 4 WSM, 1 RAG, 1 ISN, 1 Seomra (plus 2 people involved in Seomra and one of the other groups already listed), 3 Maynooth (where they had built a group around FEE using SSN as a name as well) and 1 other person. No formal minutes were kept but basically 11 of us spent almost two hours discussing the Social Solidarity Network and a range of views about why it hadn't worked out as people imagined and what if any future it had were expressed. There wasn't consensus on either of these, if fact there was a wide range of views on what it should have been as well as if and why it didn’t function. The decision we came to was that this meeting represented a phase change in the SSN, the point at which we acknowledged that the original plan for how the SSN would develop had not come about. The email list would continue to exist and people were free to continue to use the name / organise events under the SSN name. Two concrete ideas that individuals might pursue were to hold a regular social / information exchange and to use Seomra Spraoi to invite in speakers from (community) organisations to talk about their struggles. In reality the SSN ceased to exist around this point with only Laurence V attempting to call a couple of follow on meetings which appear to have had a tiny attendance and out of which nothing came. In retrospect it might have made more sense to have a formal vote on winding it up but we (WSM) were reluctant to suggest this in advance of the meeting. With hindsight its obvious that the original concept of the SSN as a network of groups was never a runner as neither RAG nor Seomra Spraoi had the commitment / energy to put in the time that would have been needed if it was to be more than a WSM 'front'. However enough people turned up at the initial meeting and at least one of the follow up meetings to make it appear that there could be the potential for the SSN to grow. Effectively this shifted it from being network to being a WSM initiated campaign, a shift we failed to acknowledge and take responsibility for. This was most visible in terms of the budget day protest. We failed to make sure something had been arranged for whatever number of people turned up, even at the level of a brief 'thanks for coming' speech. So although people politically close to us did respond to the promotion work and turn up the complete lack of anything happening reflected badly on us. In general I think we fell between the two stools of not wanting to run the SSN but also not wanting to give up on it. We should have decided that either it didn't have potential or we should have come up with a collective plan for what it should do, argued this at the meetings and took on much of the responsibility for making sure these things then happened. Instead we did neither. Also with hindsight a problem that existed with the initiative was that we didn’t have any idea of what to do with people who were interested in it beyond telling them to turn up for the next business meeting. In campaigns that are intended to be broad initiatives this is a significant failure as many more people may be interested in working with the initiative but unwilling or unable to sit through regular business meetings in order to do so. This same problem can be seen in other broad campaigns we are involved in including Shell to Sea. The feedback on the first draft of this text concentrated around my use of the word front in scare quotes above. Front has different meaning in different contexts but in Ireland it tends to be very negative, basically meaning an organisation that pretends to be open and independent but is really tightly controlled by one political organisation with the primary purpose of recruitment. The problem WSM had with the SSN was that although this was not what was intended there was a clear danger that the SSN could become a de facto front. Because members were rightly concerned about that they were very reluctant to drive activity in the SSN in a co-ordinated manner. The following year we saw a variation of the experiment with the 1% Network experience where again attempts to involve Seomra and RAG resulted in only minor involvement, this was also the case with the ISN which was only slightly more active. This time around though the active involvement of eirigi prevented the de facto development of something that could have looked like a front. But more importantly the 1% Network was organised not on an assembly basis but rather as a committee of delegates from the groups involved (in practice just the WSM and eirigi). Eirigi are a socialist republican group that broke from Sinn Fein around 2004 and who have a critique of the top down command structure of the republican movement. WSM members had been working with eirigi members in Shell to Sea for some time at the point where the 1% Network was launched - a later article will discuss the experience of the 1% Network. In the 1980’s and the 1990’s the WSM became used to broad work where we were one of a range of organisations involved and most often one of the smaller organisations. Since 2002 this has quite often not been the actual situation we faced, its quite often been more like the SSN experience where we are the only properly organised group. With the various Grassroots Gathering initiatives of the 2002-2004 this wasn’t such a major problem because the WSM was numerically much smaller than the ‘movement’ forming the network so we’d seldom make up more that 20% of the people at any particular meeting. This gave enough potential for the emergence of a spontanoeous opposition if we suggested something sufficently at odds with everyone else so that we didn’t have the fear of pushing particular ideas. In retrospect however in the Grassroots Gatherings both the major initiatives and the details of how these were carried out were mostly brought by WSM to meetings. The effective end of the Grassroots Gathering saw the major focus of activity shift to Shell to Sea which initially was a return to the safe familiar ground of working in a broad coalition that involved much larger groups like Sinn Fein and even the Green and Labour parties and where we could play the role again of the combative minority. But this meant that when it came to return to libertarian organising we failed to confront in the meantime the problem of being the only organised poll. By the time of the SSN the WSM had grown considerably and the movement had shrunk to the point where we would spontaneously have a large percentage of people at assemblies being WSM members. Something we hadn’t worked out how to deal with beyond being ultra careful not to dominate meetings basically by refusing to organise to bring ideas to those meetings after collective discussion. In conclusion the SSN was largely a collection of negative experiences and failures but often you learn more from these then anything else. The process of formation was badly handled internally by the WSM and our intervention within the SSN was weak and failed to provide the essential support that was needed at particular moment, in particular the 2009 Budget protest. 1. How such initiatives are agreed internally and once agreed how we mobilise our own membership and resources to support them. 2. How we deal with situation where we are the major pole and a significant percentage of the membership of such initiatives. This is likely to be the situation with any libertarian initiatives we launch. 3. What sort of organisational structures should we advocate that allows for democratic decision making, reliable implementation of decisions reached and engagement possibilities that can reach beyond those people with massive commitment to an issue. There are also significant issues here for those we work with around recognition that the WSM is often the motor that can drive new initiatives but that if we do so there is a danger of that role being resented as being controlling. It’s useful that everyone be aware of this as an issue and also aware that the light touch approach we adopted in relation to the SSN did no one any favours in the end. Job losses, wage cuts, cuts in essential public services, pension levies..... Our living standards and our social services are under huge attack. Mainstream media commentators and some politicians would have us believe that there is no alternative, that we have all been living beyond our means and that we have to tighten our belts in these recessionary times. But we do not have to accept their reality. We do not have to accept that people on minimum wage, unwaged workers, those on social welfare, low-paid civil servants or working class people in general should be the ones who pay for the economic crisis. We do not have to accept that our health, education, infrastructure and social welfare services should be slashed in order to bail out the banks and the property developers. Huge numbers of people recognise that we are being sold a lie. Huge numbers know that the attempts to create divisions between public and private sector workers and between different groups of ordinary people are an attempt to weaken us. Communities all over the country have organised to resist hospital closures, cuts in hospital services, education cuts and other attacks on social services. Senior citizens fought valiantly, and ultimately victoriously, to retain the right to a medical card for over 70's. Communities and workforces all over the country are organising resistance to threatened attacks and cutbacks. Groups such as Waterford Crystal workers, Visteon workers in Belfast, Thomas Cook workers, Custom House cleaners in Dublin, Marine Terminals Ltd. Workers (Dublin port) and Mr. Binman workers (Co. Tipperary) and many more have fought back against job losses and attacks on working conditions. The Social Solidarity Network is coming together to provide a forum for workers and communities to unite to resist the attacks, and to build links across the many struggles which will break out over the coming months. On Saturday 3rd October we are holding a meeting which will provide a chance for people to come together and share their personal experiences, explore the economics of the crisis and plan ways in which we can build resistance. We have identified 3 main areas for discussion – Workplace Resistance; Unemployed/Unwaged/Community Resistance; Education Cuts resistance. In each of these areas we want to explore how opposition to government cuts can be encouraged and co-ordinated. These are of course only our ideas and we are open to suggestions for alternative or additional workshops. We hope that you will come along on the day, share your views and help to build a network which can share skills, knowledge and experience and which can help to bring reality to the old maxim that ‘Unity is Strength’. 1:30pm Short introduction to the day followed by breaking up into groups of 10 or less for 30 minutes discussion on how people are effected personally (work, dole etc), what if any involvement they have had in resistance, what problems they have faced in that involvement (or what has stopped them being involved) and what they think might be possible for them to do. Followed by feedback. 4:30pm Final session. - reportbacks from each group, discussion of how best to proceed - future meetings, organising etc. Attempt to come up with some concrete proposals and agree core principles. 9:00pm onwards Social evening – Chill out, relax, make new friends and discuss the events of the day in the convivial atmosphere of Seomra Spraoi. 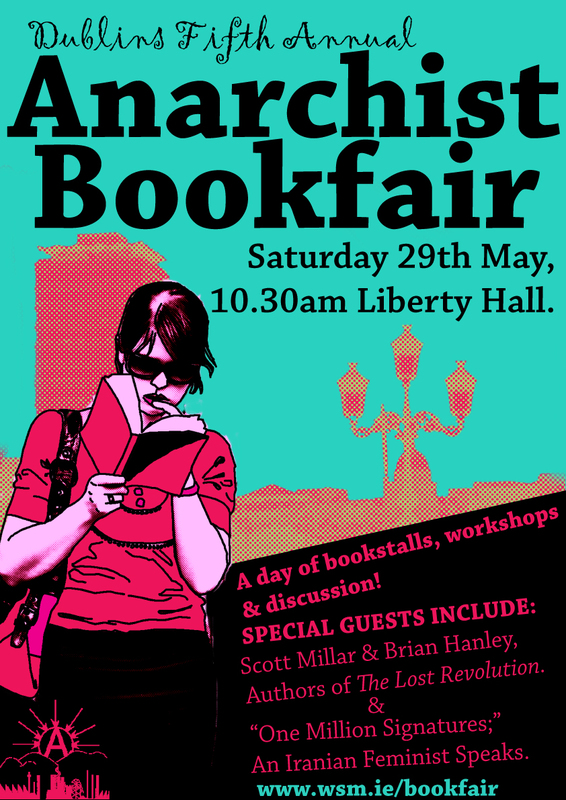 This event is jointly organised by Workers Solidarity Movement (www.wsm.ie), Revolutionary Anarcha-Feminist Group (http://ragdublin.blogspot.com/) and members of the Seomra Spraoi collective (http://www.seomraspraoi.org:8080/Plone) . It is open to all and aims to provide a space in which people can come together to support each other in building a network of resistance to government attacks on our living standards. This network will be built in an open, decentralised and fully democratic manner and will operate along non-hierarchical principles. Please come along, share your experiences and help us to build the network. The government is trying to make ordinary people pay for the financial crisis. NAMA will bail out the property developers and wealthy bankers who caused this crisis to the tune of up to €90billion. This will be done by savaging public services, slashing the wages of ordinary workers, throwing lots more workers on to the dole and cutting social welfare. It doesn’t have to be like this. There are plenty of other ways in which the money could be raised. But these would involve challenging the status quo and demanding that those who benefited from the Celtic Tiger be made to pay the price now. Where has all the money gone which changed hands during the property boom? Even if the value of overpriced land has dropped in the last few months, the property owners who sold the land at inflated prices still have the money somewhere. Even if they’ve lost a portion of it on the stock exchange there are still vast sums of money out there, the problem is it’s in the hands of a small number of people. In fact the richest 5% of the Irish population owns 40% of the wealth. This amounts to property and assets worth €400billion. Indeed the richest 1% of the population made about €75billion during the Celtic Tiger years. One day of marching will not be enough to bring about meaningful change. Ordinary workers whether working in the public, private or community sectors, the unemployed, homemakers and all who care about building a decent society need to get organised and fight back to defend our public services and our wages and working conditions. The Social Solidarity Network is a grouping of people who have come together to provide a forum for workers and communities to unite to resist the attacks and to build links across the many struggles which will break out over the coming months. We hope this Network will become a means of actively continuing to resist cutbacks in all spheres of life. We want to expand the Network as widely as possible. Please join in an open discussion after today’s march to take part in building those links and developing a unified campaign to make the ones who created the crisis pay for it. -1- Talked about the low turn out at the meeting and wondered if people on this list are still interested in being active as Social Solidarity Network. It would be good if you can respond with any thoughts and ideas on this. We had a bit of discussion around organising things differently and what the sub groups were doing. The main thing is that it would be good to get some responses on the mailing list. "Show You're Angry; Make Lots of Noise"
We're encouraging people to be noisy in their reaction to this budget - bring noisy things ... and make some noise! Can everyone on this list circulate a notice of the Budget Day event to people you know, work with etc and can someone take on publicising it on line. Mark is co-ordinating banner making for the event - suggested slogans "Tax the Greedy Not the Needy" and "Reverse the Cuts Make the Rich Pay". Banner making will happen in seomra spraoi and he'll be in touch with times. We discussed the idea of organising a meeting to advertise at the event but decided against it. Instead we will try to get contact details from any interested people. We will have a desk where anyone interested can sign up to the mailing list. The government has inflicted growing hardship upon workers and communities across the country, spreading the ethos that we should all commit to sharing the pain. This has been perpetuated by mainstream media, as “sharing the pain” has been portrayed, as the only way out of this crisis. The Social Solidarity Network (SSN), however, believes otherwise, and wishes to provide people and communities with an open forum that can serve to resist these attacks and to share and spread information among individuals and groups affected. The SSN aims to make links between different struggles (from workplace and community organising to resistance to educational cutbacks and unemployment) so that a network of resistance can successfully be built. We had our first meeting on the 3rd of October in the Seomra Spraoi social centre. It was a positive day that saw around 40 people coming together. It involved the sharing of experiences, much discussion about the crisis and potential ways of resisting its effects, film screenings, dinner and an evening social event. This was followed by a second meeting on the 19th of October, which focussed on continuing previous discussion and furthering the growth and potential of the network. Much attention was given to building for the ICTU national demonstration on November 6th, as it was seen as an important way to show the government that Irish people won’t just lie down and accept cuts to vital social services and as an indication of the mood for a fight back. The Budget is going to be a massive attack on ordinary working people and the poor across Ireland. Lets show our anger in huge number outside the Dail on Dec 9th as they waffle within. The Social Solidarity Network is joining the protests that day at 5pm to demand "Reverse the Cuts Make the Rich Pay" and "Tax the Greedy Not the Needy". Other organisations have already announced protests at the Dail that day including the Dublin Council of Trade Unions, Shell to Sea and the INTO and we are sure more will follow. We'll be joining these during the day and would encourage others to do the same as we build towards a massive protest between 5 and 7pm. We hope to see you there. “We can expect huge attacks on the living standards of ordinary people in this budget,” Malone continued. “While those who benefited from the Celtic Tiger get away scot free, the rest of us are being asked to pick up the pieces. But the rich must be made to pay for the crisis they created. So we’re asking people to rally under two slogans - "Reverse the Cuts Make the Rich Pay" and "Tax the Greedy Not the Needy". “We’re also asking people to come prepared to make lots of noise. It’s time that we let the government know the level of anger that there is in the country. So people should come and join our protest in huge numbers and show our anger outside the Dáil as the politicians waffle inside.” Mr. Malone concluded. The SSN protest is just one of a large number of protests planned for the Dáil on Budget Day. The Social Solidarity Network is a grouping of people who have come together to provide a forum for workers and communities to unite to resist the attacks and to build links across the many struggles which will break out over the coming months. The government plans to cut €4billion from this year’s budget – one-third by cutting public sector pay, one-third by cutting social welfare and one-third by cutting public services. ICTU’s 10-point plan ‘There is a Better Fairer Way’ accepts that we all have to ‘share the pain’ and fails to address the fundamental fact that the wealthy must be made to pay for the crisis. But a radical agenda is needed. There is another way – The wealthy must be made to pay. Here are just 3 examples of ways in which this could be done. There are plenty of others. The top 1% of the Irish population owns 34% of the wealth. The asset base (excluding residential property) of this tiny number of people rose from €25billion to €100billion between 1995 and 2006. (source: Bank of Ireland Wealth of the Nation report). Even a modest 40% tax on this massive wealth would raise 10 times the amount of money the government needs to find this year. 775,000 workers in the Irish workforce earn an average of €15,000 a year or less - that's €290 a week. Another 400,000 are on an average of €25,000 - €480 a week. Yet, 1,447 people earn an average of €2.3million (€44,230 per week). (source: Gene Kerrigan, Sunday Independent 8th March 2009) Would it really hurt badly if everyone had to manage on a maximum income of €100,000 per year (that’s €1,920 per week – not exactly poverty wages)? Gas and oil reserves worth at least €420billion have been discovered off the Irish Atlantic coast. The Corrib gas field alone is worth over €30 billion. Why not re-negotiate the generous licensing terms signed by Ray Burke in 1987 with Shell and other oil companies and use these resources for the benefit of the Irish people? • Organise for a national strike which will unite public and private sector workers under the slogan – ‘There is ANOTHER way. Make the wealthy pay’. The first step in building this is to have a one-day strike BEFORE the December budget to let the government know we are serious and to respond immediately with strike action if wage cuts are included in the budget. Failure to strike before the budget will be seen by the government as a sign of weakness. • Organise within our individual unions for an end to so-called ‘social partnership’. ‘Social partnership’ has never been in the interest of workers. The last year of so-called ‘talks’ has been a way for the government to string the unions along while planning their attacks on us. Now is the time to end this farce. • Help to organise rank and file networks within individual unions and across unions. We need to take control of the unions in the interest of ordinary members. Trade union leaders on massive salaries cannot represent the interests of their members. Trade unions are our organisations and we need to organise to take control of them. • Support workers who are not unionised to get organised and join a union. An effective national strike will need to include all workers in the public and private sectors. It is in all our interests to support and encourage all workers to join a union. The leadership of the Irish Congress of Trade Unions have shown by their actions that they cannot be trusted. The challenge for all trade union members is to get actively involved at a local level in organising the fightback. We are told that there is no choice but to cut wages and drive down the living conditions of the unemployed and others dependent on social welfare. This is a lie. Here are three simple ways that enough money could be raised to stop every proposed cut. In the longer term there is the equivalent of 10 billion barrels of oil off the Irish coasts. This is almost been given away to Shell and other companies at the present. If the government took 70% of this, the rate Russia, Angola and Nigeria among other countires do, this would see 294 billion coming in as these fields are developed. To force the adoption of the program above we need a huge fight with the government and employers. The more organized and united we are for the fight the less it will cost us and the quicker they will have to give in. This fight is the fight of workers, the unemployed and the community, it is not the fight of the union leadership. They may be with us at different stages or they may be against us so the fight has to be in our hands. If your in a union talk to people you work with who are not members about joining. Keep talking to them about this until they join. Push for regular meetings in your workplace of all union members to discuss how to respond to each development in the crisis. Don't leave this to union reps. If your union rep doesn't consult the members or is conservative have a recall meeting and elect someone else. If your not in a union start to talk to your fellow workers about organising. Talk to those you trust first and when enough agree met up and decide which union to approach. Keep meeting as a group, joining a union will help legally but you are the union so don't expect 'the union' to fight for you. A union is only as strong as its members and only retains that strength as long as you keep creating it. If your not working this means you can play a part by organising in your community, or if unemployed organising a local unemployment action group or if a student organising a student resistance group. Everyone has a part in this fight. What will victory look like? We cannot answer this exactly. We can say the employers and government will not give in easily. They will be forced to give in by national strikes of all workers and widespread civil unrest. As we fight we will organize, if they hold out too long and as we gain confidence we may collectively decide we don't just want bread, we want the whole bakery. on Budget day was far from a success. organisation that we had all hoped. suitable for any of you who wish to attend. views on the future viability of the SSN. No formal minutes were kept but basically 11 of us spent almost two hour discussing the Social Solidarity Network and a range of views about why it hasn't worked out as people imagined and what if any future it had were expressed. There wasn't consensus on either of these. that individuals might pursue were to hold a regular social / information exchange and to use Seomra Spraoi to invite in speakers from (community) organisations to talk about their struggles. If your interested in helping with either post to the list saying so.